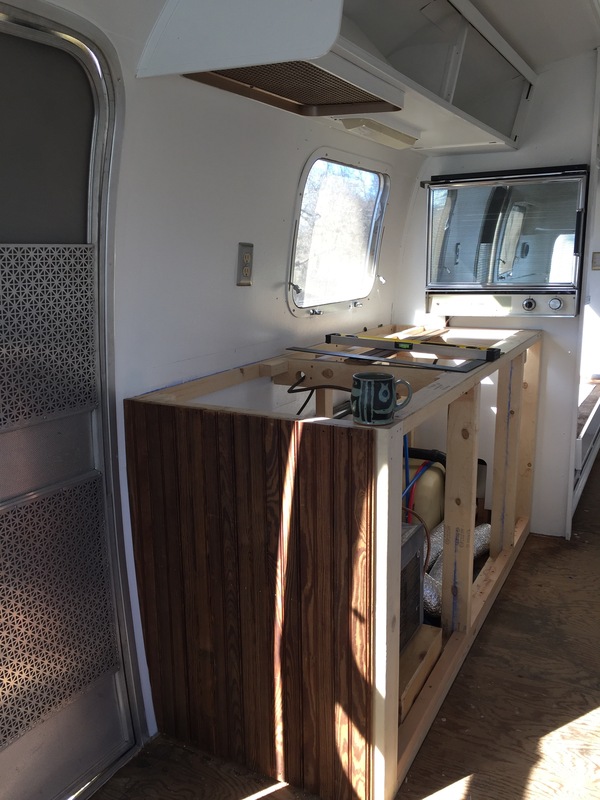 Today, I’m drafting up this post from inside the Airstream, which is a testament to its slowly improving comfort level. Progress overall seems to be coming in leaps and bounds now, which I owe so much of to my dad and Mason. They have been pouring almost all of their free time to building our kitchen counter, and soon, the dinette/bed arrangement. Even the floor will be in any day now – a moment that will finally make it feel more like a home and less like a construction zone. After that, it’s just curtains and cushions and the move-in process will begin! 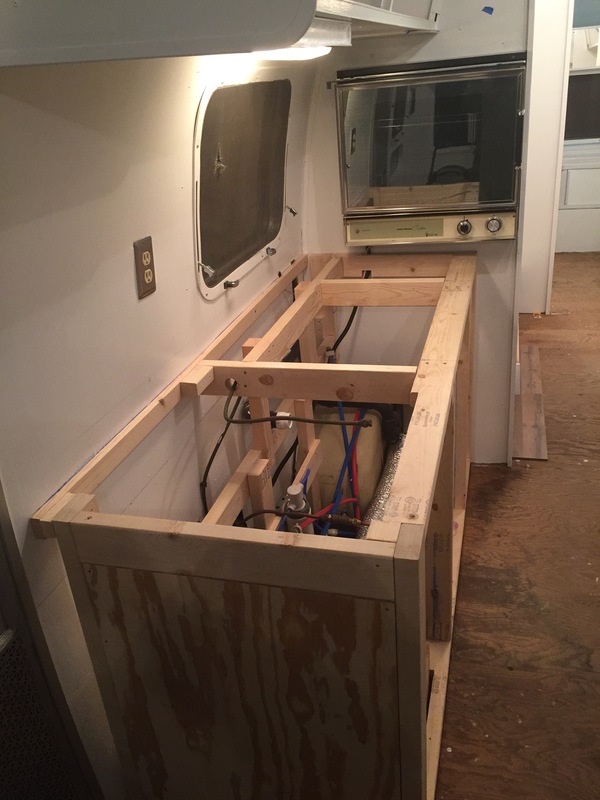 Retrofitting around the original plumbing, wiring, and appliances makes things move at a snail’s pace, but it also makes me feel like we’re keeping the original character of what the Airstream was – and now gets to continue to be. 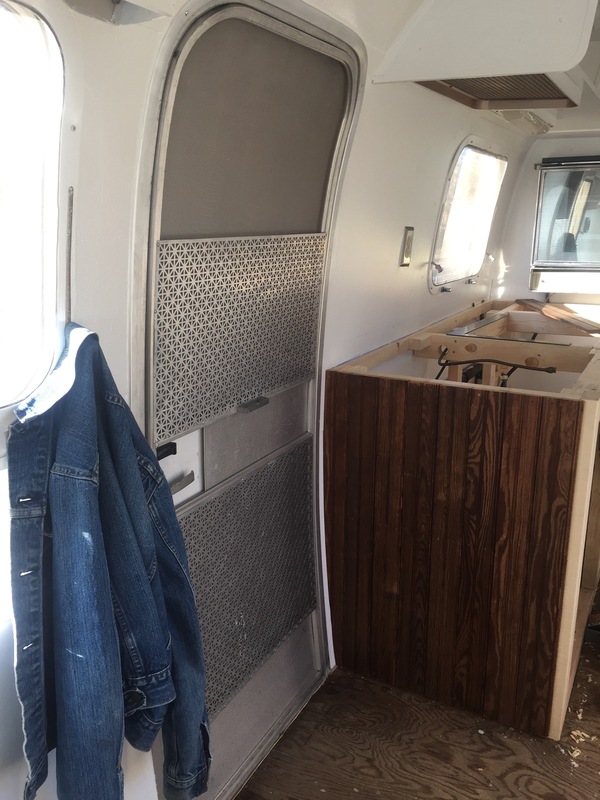 Everyone, I’ve learned, has differing standards and limits when it comes to renovating a vintage Airstream. Mine was that I needed to cover up the brown veneer cabinets and yellow vinyl walls with a fresh white. Mason would’ve been fine with keeping them as they were, and surprisingly, I did start to miss the brown. So now we are incorporating reclaimed bead board from my great-great grandparents house – bringing back some earthiness while also bringing in sentimental value. Probably that I’m too sentimental, perhaps even a bit eccentric and stubborn in my approach to keep almost everything in tact. Yet, I think deep down I always knew it was important for me to feel like we were restoring her rather than wiping away her past. Don’t get me wrong, when you look inside our new counter to see the lengths my dad had to go to to keep all the plumbing fixtures in tact, you’d think we are crazy. Why in the world didn’t we just gut it? Isn’t that what a sane person would do? It certainly would’ve made things much simpler. And yet, every time I’ve banged my head on the front rolling tombour cabinet, or got paint in my hair from trying to paint an inch of space behind the oven, or found all the spots where we inevitably didn’t do a great job painting — all the complaining I’ve done — has made me incredibly fond of every.single.millimeter. of our aluminum bean. Despite all those silly tears I’ve shed, I value the growing spurts its given me, M, and our relationship. It embodies all of our wildest dreams. Reminding us that, yes, no matter how unconventional or difficult something may seem, it’s possible if you have the will and the heart for it. That’s a realization I wish I could give to every person I meet. This little place we are creating has been touched and toiled over by so many special people, I can’t even begin to imagine the moments we will share together in the future. It’s really teaching us the meaning of home, every last rivet of it. It’s looking beautiful! Don’t compromise on fixing it up just the way you want it. I can’t wait to see the finished project.